Ever wanted to fly or find your inner ninja? Learn the basic elements of partner based acro yoga. It’s good to mix things up, even if it sounds like an odd recipe. All three styles truly balance each other out (pun intended). Let’s drink straight from the source at AcroYoga.org: “Acro Yoga blends the wisdom of yoga, the dynamic power of acrobatics, and the loving kindness of healing arts. These three lineages form the foundation of a practice that cultivates trust, playfulness, and community.” Who can say no to that? You need not be a master gymnast, circus acrobat, or seasoned yogi to enjoy. Can’t do a handstand, or even touch your toes? No big deal. Acro Yoga is a practice of substance, not flash. You’ll learn necessary building blocks to literally take whatever physical skills you have to new heights. You may think big people do the lifting, and tiny people do the flying. This is not the case. Acro Yoga doesn’t defy gravity, it honors it. Technique is more important than strength. You’ll quickly learn that muscles tire while bones don’t—whether lifting someone above your head, pouring weight through hands for a healing touch, or counterbalancing someone twice your size. When was the last time you let someone else physically move you? A good Acro Yoga class creates a safe container in which participants learn the art of allowing movement. Depending on the material taught, this could mean total engagement, utter release, or some degree of both. Everyone in class goes through the same experience. As you learn to support others, you end up allowing yourself to be supported. This is a fundamental of trust: take control by letting go. Unlike practicing alone, where we spend a lot of time in our head, partner work is deeply rooted the shared experience. In addition to honing the skill of sharing a physical practice, Acro Yoga helps to develop open, direct, and compassionate verbal communication with whomever we’re paired.Try giving someone directions while in handstand. Up becomes down. Left becomes right. Things can get mixed up when life gets flipped asana over tea kettle. Work together or fall apart. You decide. The practice of Acro Yoga is split into two parts, Acrobatic (Solar) and Therapeutic (Lunar). Each side explores the relationship between the mover and those being moved. In the dynamic Solar practice, participants learn three different roles: Base (mover), Flyer (being moved), and Spotter (knowledge of both). Lunar theraputics embraces the deeply healing connection to metta—loving kindness. Here, the Giver is the mover, and the Receiver is the one being moved. Balance is the midpoint between extremes, so it’s best to explore this practice from all sides to know where your grounded passion truly lies. Amazing things happen when one steps outside the box, and there is no coincidence that a yoga mat is rectangular. Don’t confine yourself to the soft routine of this non-slip comfort zone. 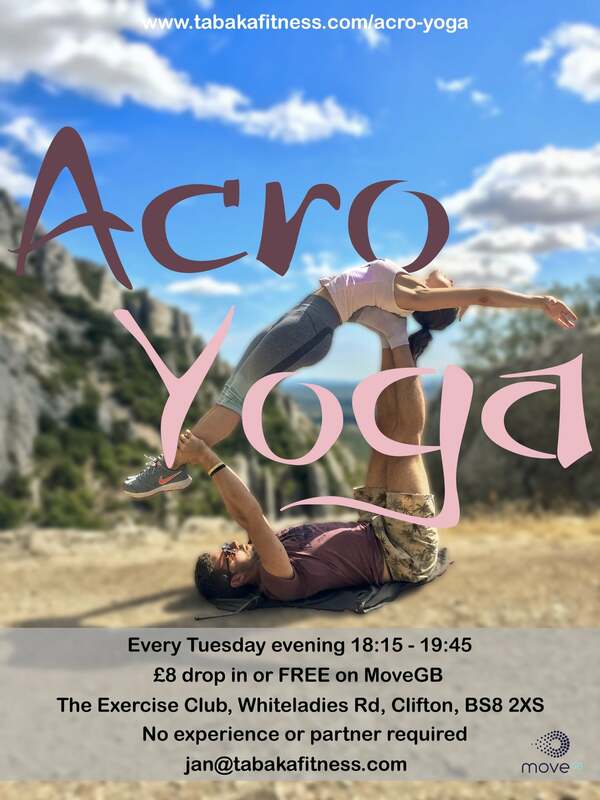 Acro Yoga creates a tangible sense of tribe and celebration which is hard to find anywhere else. Remember, it is entirely up to you how high you want to soar or how slow you want to enjoy the process of getting there. May these tips help further your existing practice or inspire you to give it at try… with love, light, and flight.